Chapel Of Love was written by Jeff Barry, Ellie Greenwich and Phil Spector. The song is sometimes referred to as Going to the Chapel . Released: April 1964 from the album of the same name. Chart Success: Spent 3 weeks at No. 1 on the Billboard Hot 100 . To-day's the day__ We'll say "I do"
Original Trio: Sisters - Barbara Ann & Rosa Lee Hawkins along with their cousin, Joan Marie Johnson. Original Name: Little Miss and the Muffets - changed to The Dixie Cups prior to their first release. 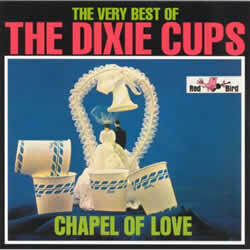 THE DIXIE CUPS chords and lyrics are property and copyright of their owners. "Chapel Of Love" chords and lyrics are provided for educational purposes and personal use only.